This Summer’s featured ingredient is Pineapple. Pineapples grow on the short stocky stems of 3 to 5 foot tall leafy plants. Pineapple plants are indigenous to the tropics of South America. It is said to have originated from the area between southern Brazil and Paraguay. From there, pineapple plants spread to tropical areas all over the globe. Pineapple plants began being grown in hothouses called “pineries” on European aristocrat estates. George Washington grew pineapples in his Mount Vernon hothouse. Due to the labor and cost of growing pineapples in temperate climates in pineries, pineapples became a symbol of wealth. Pineapples are eaten fresh, cooked, juiced, dried and preserved in a wide array of cuisines. Pineapple leaves are used to produce textiles. In the Philippines, pineapple fiber is woven into fabric for formal wear. The fiber is also used for wallpaper and other furnishings. 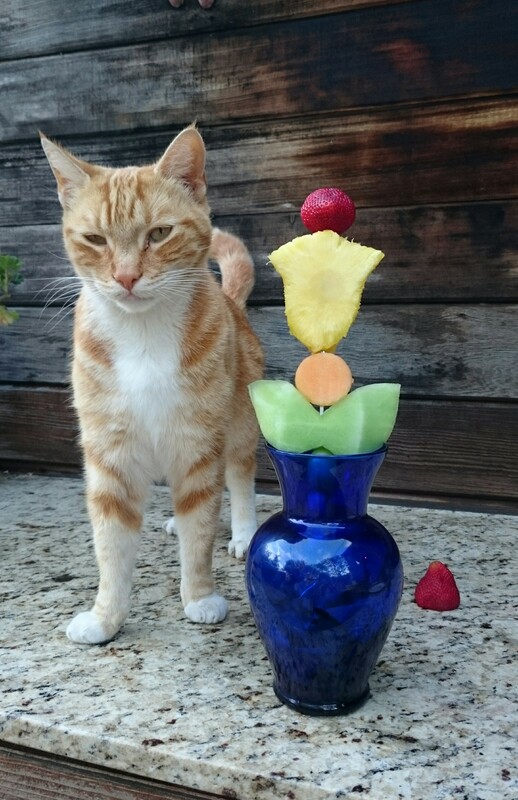 This Summer’s Recipe is for a Pineapple Fruit Bouquet. 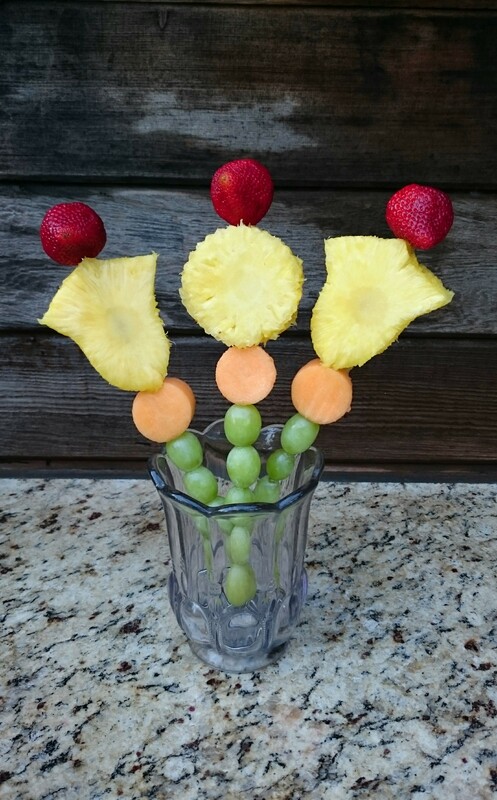 Fresh fruit bouquets are a delicious way to share summer fruits. 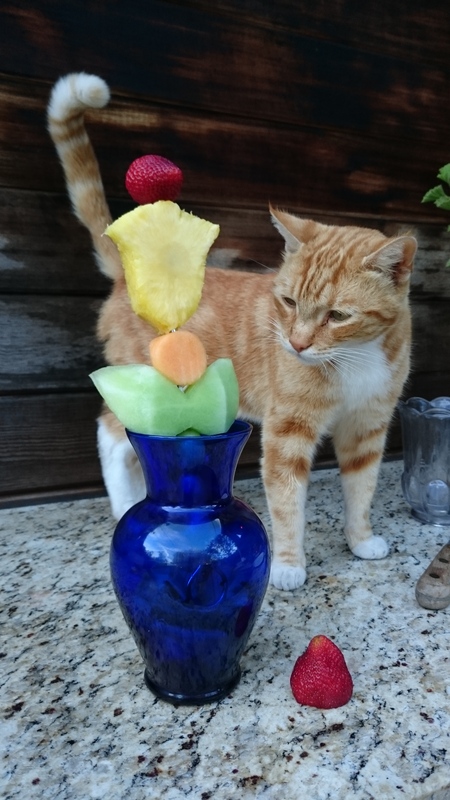 Skewered fruit “flowers” can be arranged in bouquets as gifts, or brought on a platter to picnics and potlucks. Dip flowers in white chocolate ganache that has been colored with a drop of food coloring for an especially decadent bouquet. Flowers can be enjoyed fresh, grilled, or frozen for a chilled treat on a hot sunny day. Dip flowers into nut butters or yogurt for a more substantial snack. Safety Recommendation: Parents provide preparation of fruit requiring a knife. 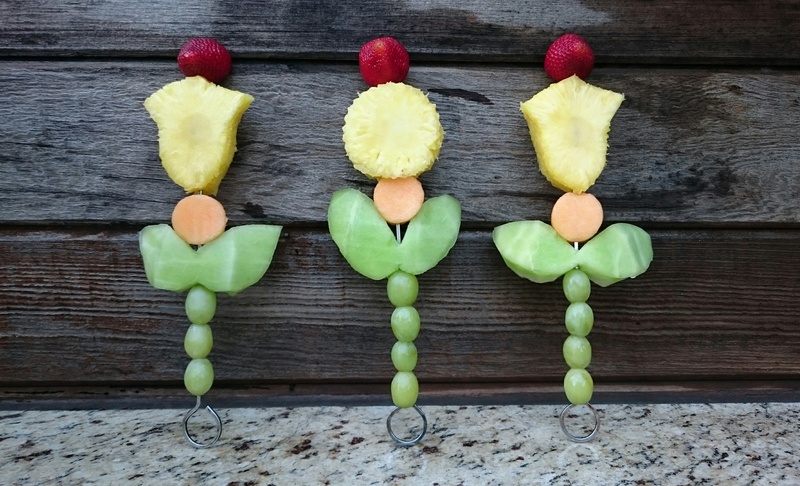 Children can then use cookie cutters to cut fruit into shapes and skewer into flowers under parent supervision. Educate children regarding skewer risks and safety. Removing fruit from skewer before placing fruit in mouth is advised. 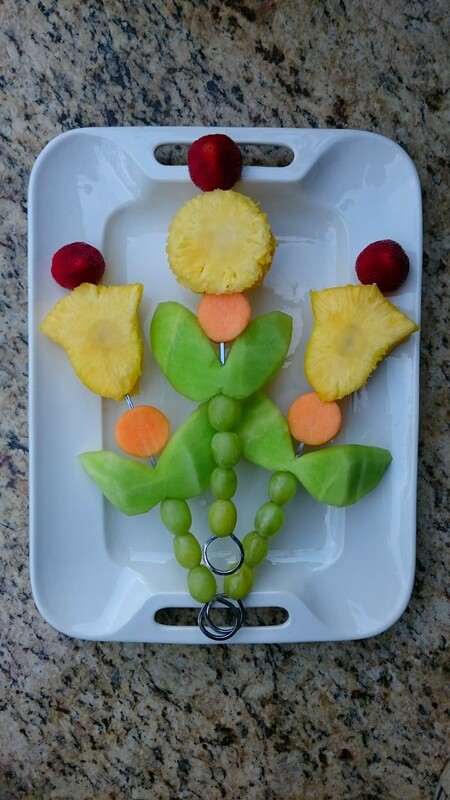 For younger children, parents may wish to eliminate skewers, instead having children arrange fruit flowers on a platter. variety of colorful, thick, firm fruits such as melon, strawberries, nectarines, peaches, mangos, kiwis, large blueberries and grapes. 1. 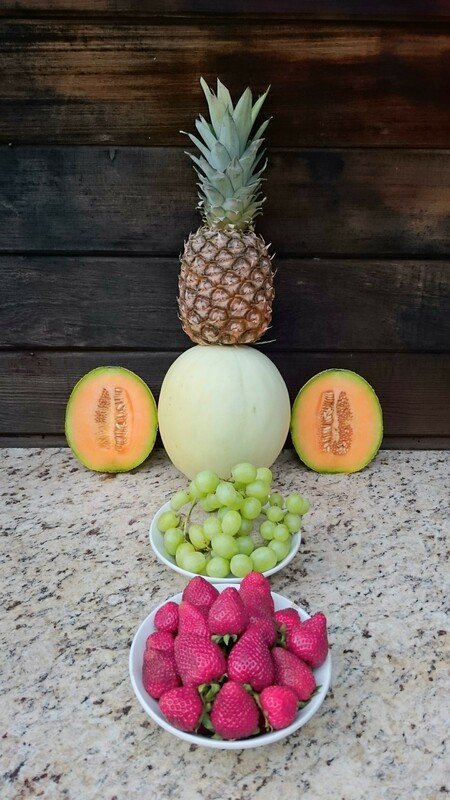 Peel pineapple, melons and kiwis with knife. 2. Slice peeled pineapple and melons into uniformly thick slices. 3. Cut kiwis into flower shapes or slice into uniformly thick slices. 4. Remove stems and leaves from strawberries. 5. Cut peaches, nectarines and mangoes in half and remove pits. 6. Remove grapes from vine stems. 7. Cut shapes out of thickly sliced fruit with cookie cutters. 9. 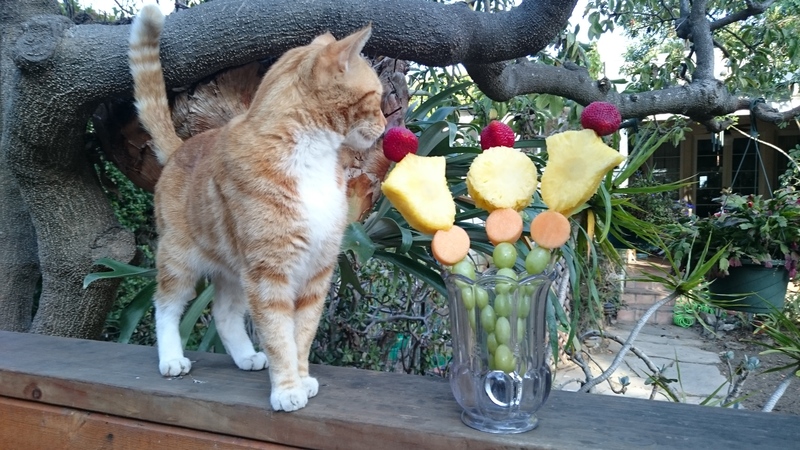 Arrange flowers in vase or on tray, or insert into half a melon/pineapple with flat side facing down. Enjoy! 1. Marzieh Ghaedi. “The wonderfuls of fibonacci numbers in the hidden nature.” International Journal of Medical and Computer Science, Volume 1, Issue 1. 2. Julia F. Morton, J. “Pineapple.” Fruits of warm climates, p. 18–28, 1987. 3. S.H.W. “The flesh eating pineapple.” Melbourne University – Scientific Scribbles, October 7, 2012. 4. “History of the Pineapple.” Dole Plantation.